Curcuma domestic in flower in the middle of summer. 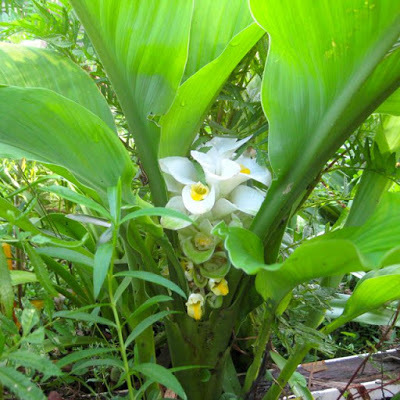 This is the plant that has the yellow ginger root from which we derive turmeric powder – the aromatic curry spice. So what is it all about? It’s definitely time now for me to get down on paper what I know about this wonderful plant – wonderful for it’s health giving properties and its use as a landscaping plant in the sub-tropical garden. 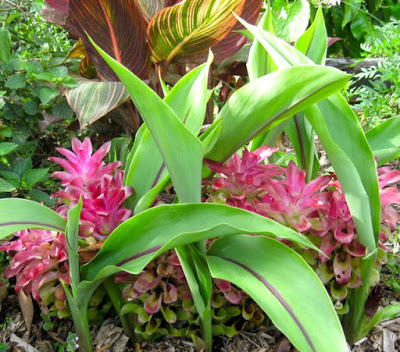 A perennial plant of the ginger family, native to India and parts of Asia. Propagated in spring from knobbly roots, called rhizomes, which have thick, finger-like side-shoots. Leaf stalks rise to 1 metre or more high. Vibrant green leaves are lance-shaped. Floral spikes 20cm long, with thick clusters of pale green pockets with creamy/yellow foxglove-like flowers peeping out of each pocket, and a mild spicy aroma. When to harvest: The leafy parts of the plant begin to yellow and die down in autumn – this is the time to harvest the edible yellow rhizome. 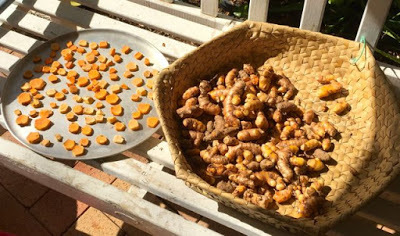 If you leave it in the ground it will re-shoot in the spring with the clump increasing in size over time and the turmeric root becoming more yellow and aromatic – that’s why I usually harvest it after the second year when the flavour and colour has intensified. Uses in Landscaping: It’s a great addition to any sub-tropical garden with its lush green spear-like leaves and striking delicate flowers. There is also a pink-flowering variety that is native to Australia with a very attractive red stripe up the mid-vein of the leaves. 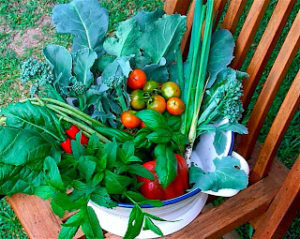 It’s happiest in moist, rich soil away from the intense heat of the midday summer sun. Just remember where you have planted it so you don’t crowd it in with taller plants that will hide its’ loveliness when it pops up again in the springtime. Curcuma australasica – the native Australian variety. I haven’t tried eating the root, but I’m sure you can, but it is not yellow. This is a job for some sunny weather! After digging up your turmeric clumps you have to give them a good wash to get all the soil off and trim off any roots and stems. 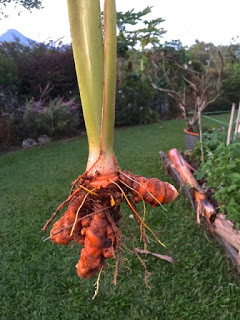 The fingers of turmeric will easily break off from the main stem. Leave them to dry in the sun before you cut them. 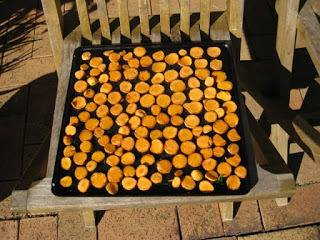 Then, you simply slice them up and put them on baking trays out in the sun. You will have to turn them over a couple of times. When the turmeric slices have dried completely they shrink dramatically, usually after a couple of days. I then use my electric spice grinder to turn it into powdered gold! It’s very easy. 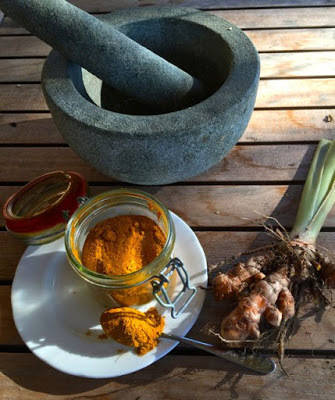 First, let me say that this ‘new’ blockbuster nutrient is actually really old and has been an important part of the diet of Sub Continental and South East Asian cuisines for centuries – where would any curry be without turmeric? NOTE: On my frequent travels to Indonesia,where I have been the guest of a family, they always have a jar of turmeric jamu (medicine) in the fridge – which consists of grated fresh turmeric, fresh lime juice, honey, water and often fresh chilli. This is left to intensify for a few days and then a tablespoon of the liquid is taken with water. This is their all round, every day tonic. Turmeric is recognised as being an anti-inflammatory, anti-fungal and anti-bacterial compound. In addition, as a recognised powerful antioxidant current research is showing help with everything from heart disease to Alzheimers. Another recent article in the Guardian quotes new scientific studies that also confirm that the anti-inflammatory properties of curcumin was more effective in treating rheumatoid arthritis than prescriptive anti-inflammatories. Importantly, it has also been found to inhibit the growth of cancer cells. NOTE: From all the current research that I have read it is stressed that taking turmeric in its natural state, either freshly grated or in its powder form, is far more effective than taking it as a manufactured supplement. You have to eat your way to good health and not expect it from a pill because the benefits and complexities of whole foods, and how the body metabolises them, is still in the early stages of scientific understanding. To quote Cohen again: “A key challenge we have faced in the past is how to ensure curcumin is absorbed into the body to provide therapeutic benefit.” As well as using it in curries (where it is responsible for the yellow colour) and smoothies, he often has it with milk as the fat, he explains, helps absorption. Taking the natural-first approach, is also backed up by Melanie McGrice, spokeswoman for the Dietitians Association of Australia. trendy cafes worldwide are now offering ‘ginger chai’ or ‘golden latte’ with a similar recipe to the one below. Golden Milk or haldi ka doodh has, in fact, been used in Indian natural medicine as a winter drink to heal coughs and sore throats for longer than big beards and hipster baristas have been around. I have a bung knee so I’m off to boil up a golden brew!